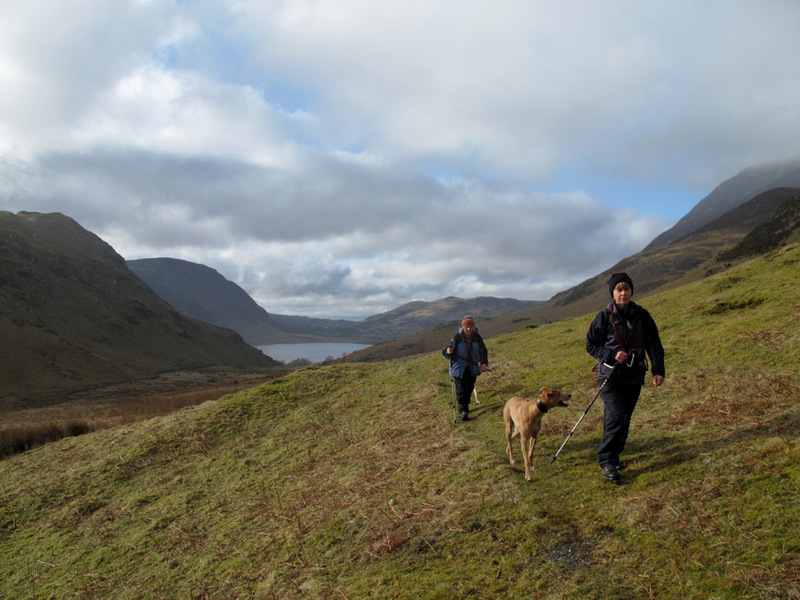 " Rannerdale Knotts and Low Fell "
Date & start time: Saturday / Sunday, 16/17th March 2013. 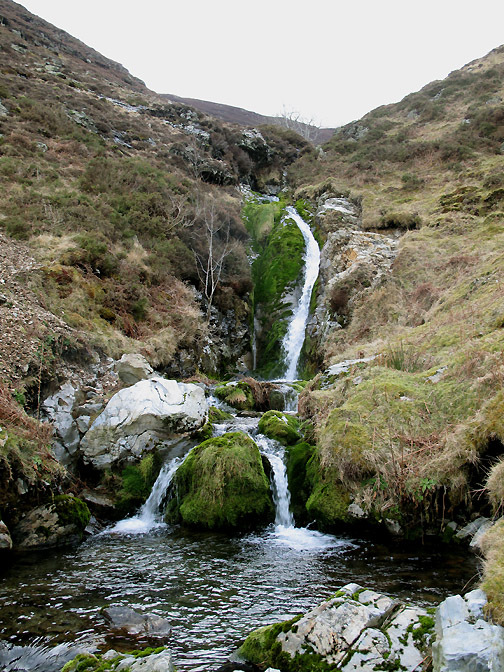 Places visited : Rannerdale Beck Falls and Rannerdale Saturday, Low Fell on Sunday. 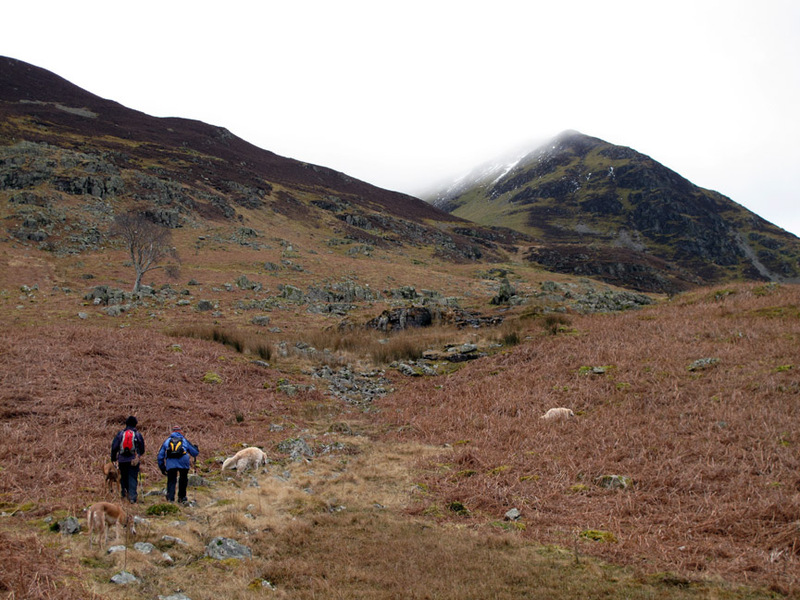 Walk one : 3.4 mls, 1250 ft of ascent, 3 hours. Walk Two : 4.25 mls. 1400 ft of ascent, 3 hours. 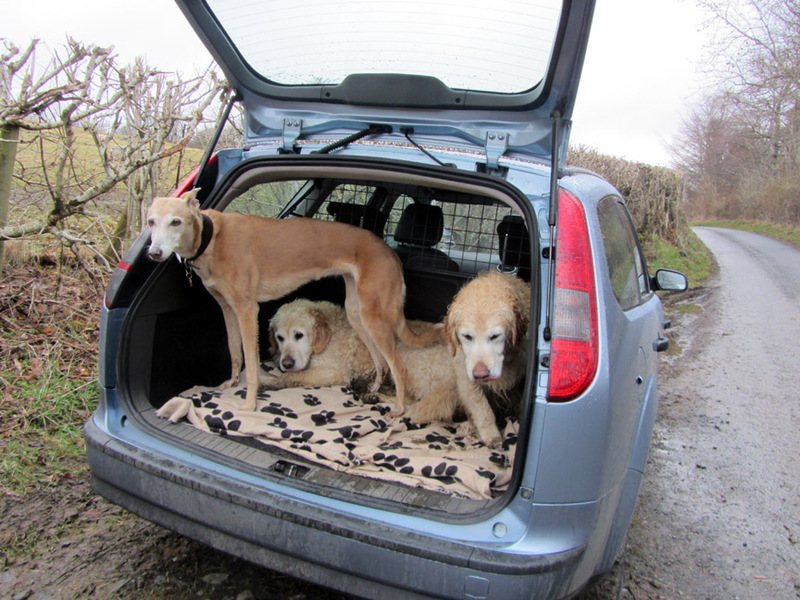 Walked with : Jo, Ann and the dogs, Jodie, Amber, Harry and Bethan. Weather : Contrasting to say the least ! 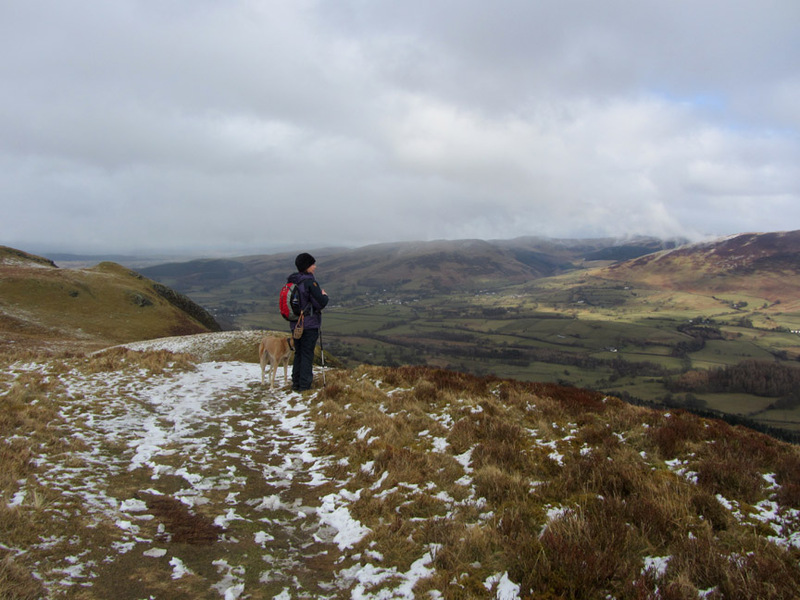 Jo is over for the weekend again but the weather isn't quite as kind as it has been recently. The sunshine and blue skies have gone in favour of overcast conditions but with a damp sort of penetrating cold. and delayed our walk till after lunch. 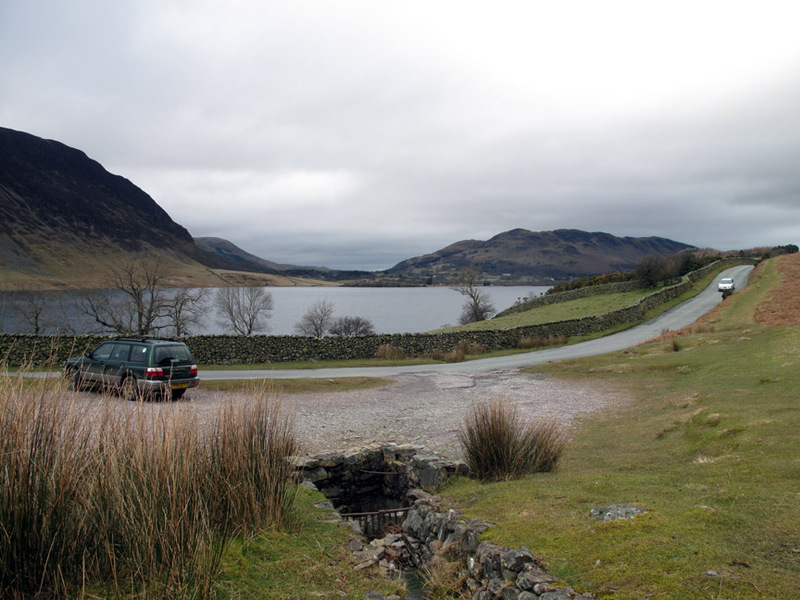 A rather deserted Cinderdale car park on the side of Crummock Water. It is not prime holiday time but there should be more visitors about than this. 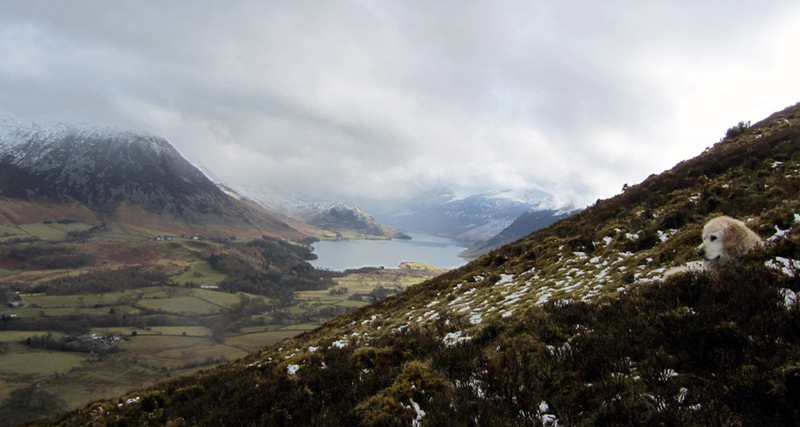 and to extend it if the weather held true to the forecast with a climb up Rannerdale Knotts. 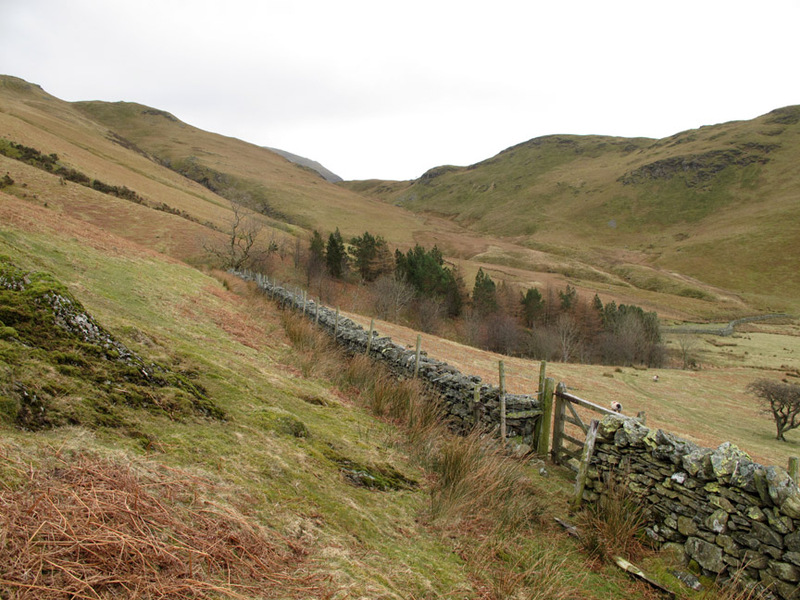 From green grass (albeit rather yellowish in the winter conditions) to the ruddiness of the residual bracken on the higher slopes of Lad Hows. 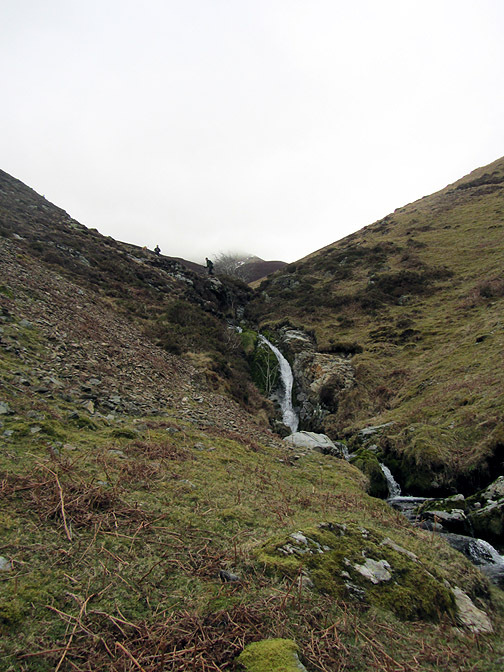 We kept to a lower path instead of heading for the high fells. but hey . . . why not give it some moral support. Round the corner we gain our first sight of the lower falls. A close up of the plunge pools and water slide. 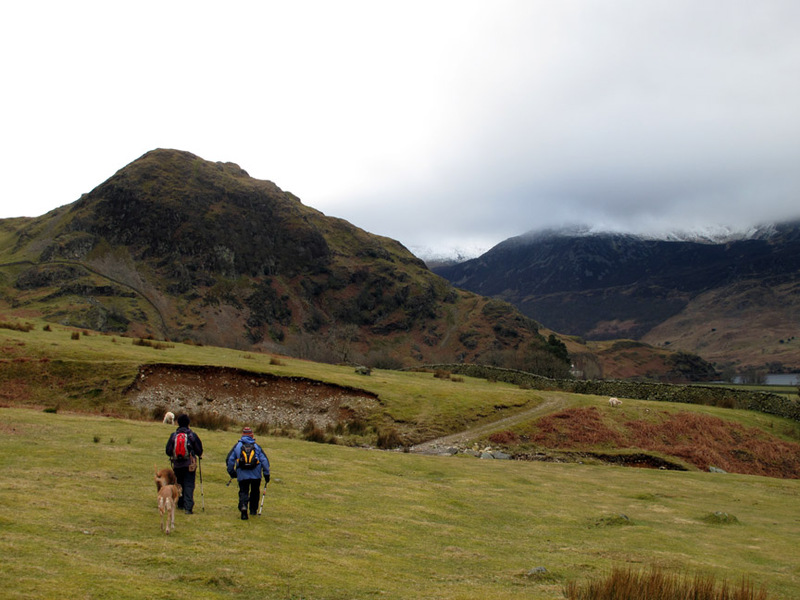 and then climb Rannerdale's steep side and make our way back this direction to the summit. 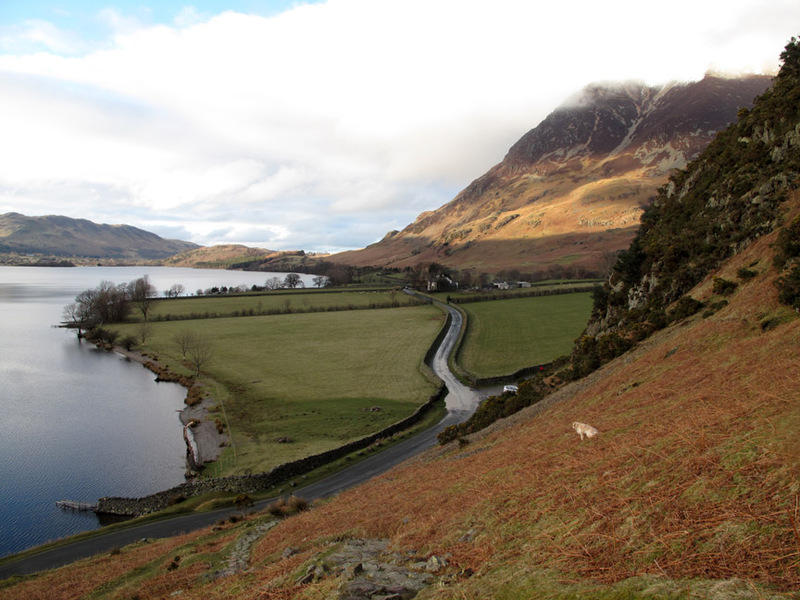 Walking up with sunny Crummock Water in the background. Sunshine encourages us to look around at the ever improving views. 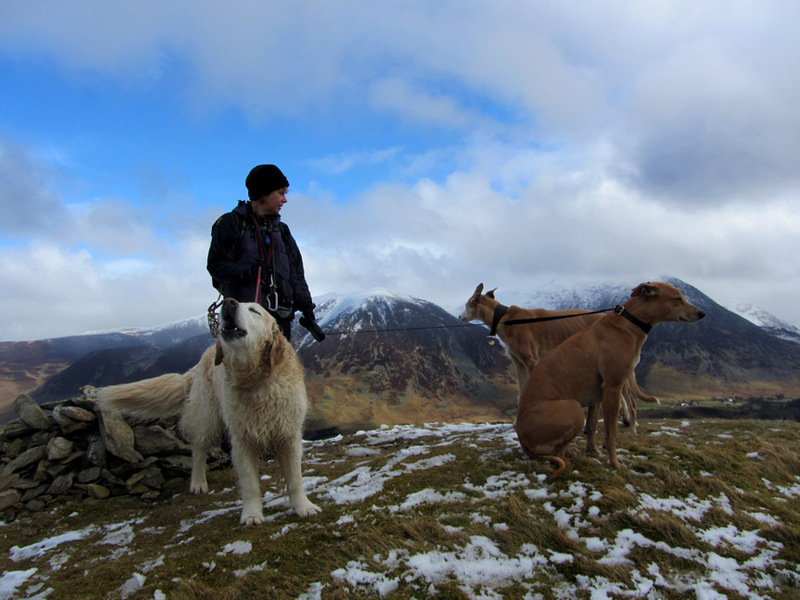 Snow showers were coming and going, across the summit of Grasmoor. Hold your cursor over the picture to see them come and go ! after chatting with those three nice folk from Cockermouth. 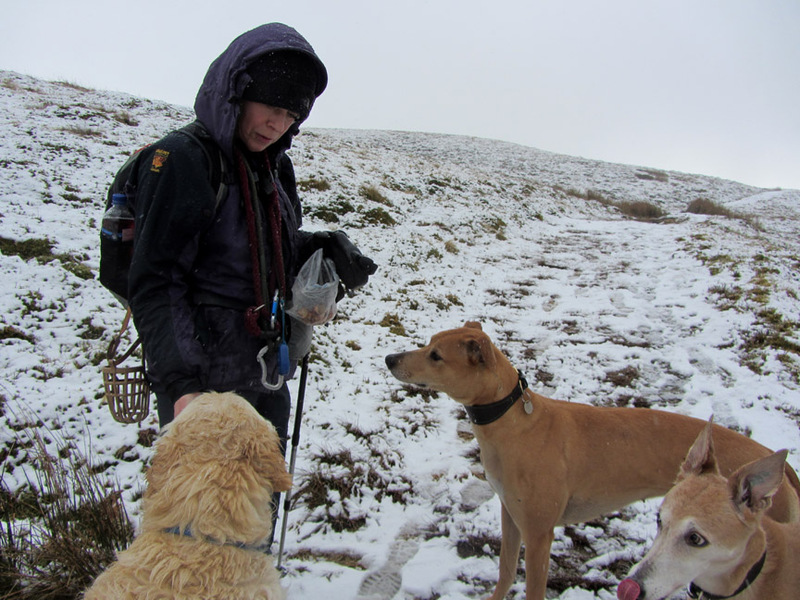 Time for a small hand out of dog-treats. 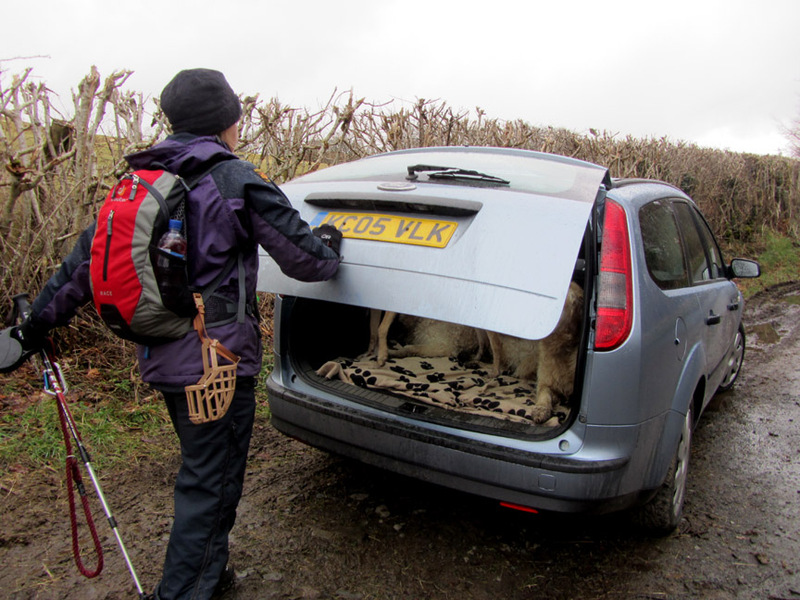 Jo saves her's for the summit . . . and instead looks around at the view. 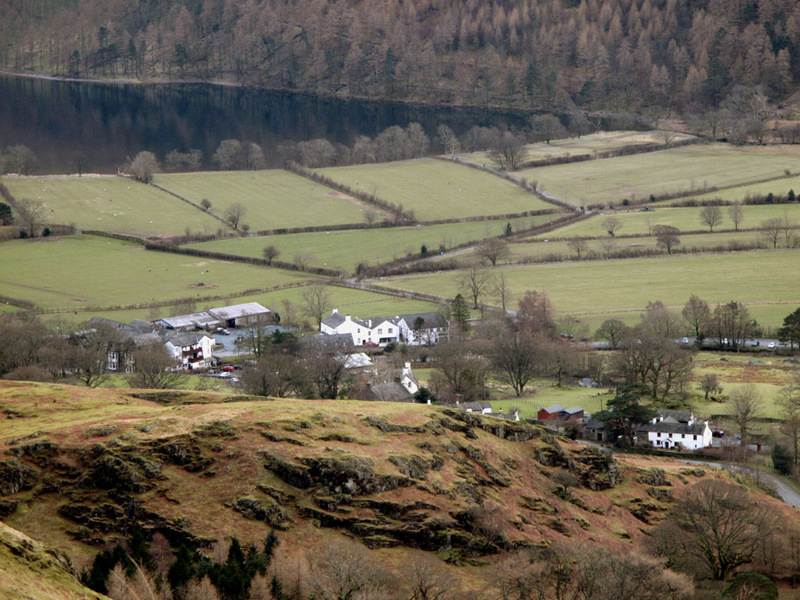 The small islands of Crummock on one side and Buttermere Village on the other. Ann climbs the easy scramble to the minor summit . . .
. . . now with a mega-cairn . . . all of five inches high. 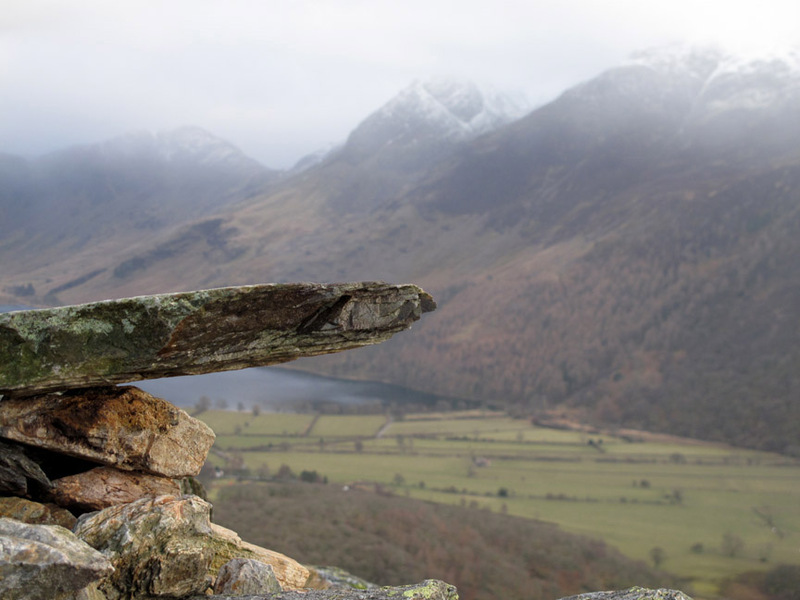 Rannerdale's Cantilever Stone . 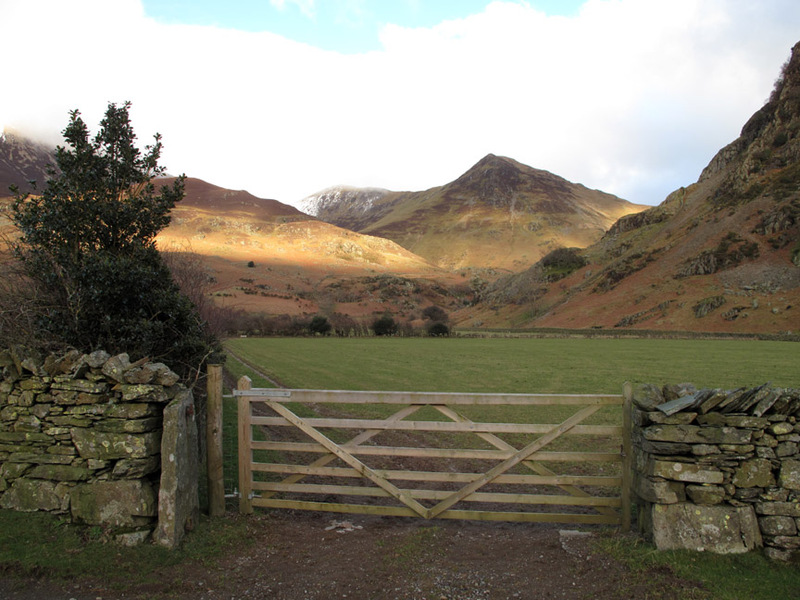 . . similar to the Glyder's in North Wales . . . only smaller. Time to magic a treat for us out of thin air. 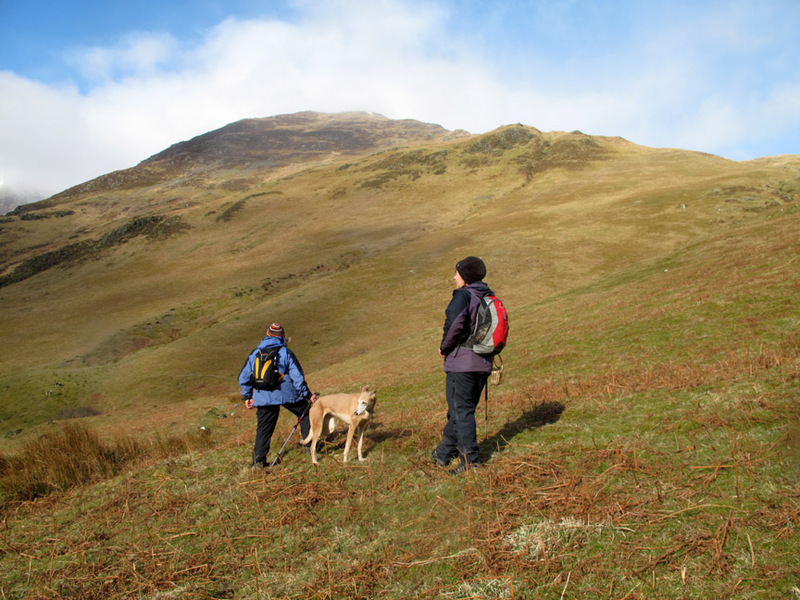 Hold your cursor over the picture to gain a summit reward. 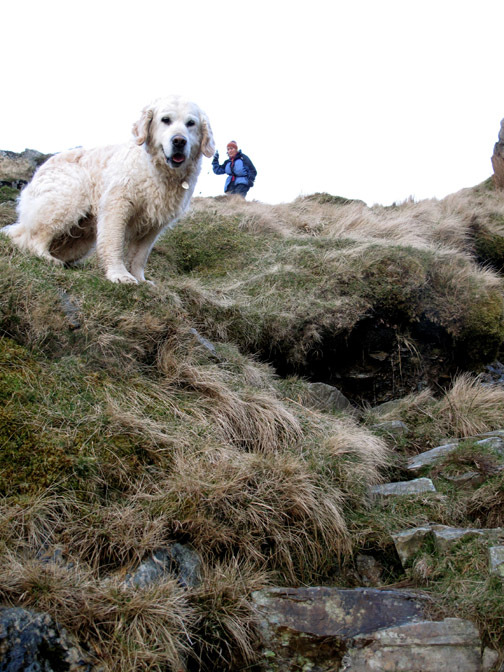 Big Dog and Little Ann . . .
. . . starting the steep descent to the hause. Afternoon sunshine beams out from behind Mellbreak and Great Borne. The gentle breeze also forms nice patterns on the water, which entertain us we descend to the lake side. No car here today . 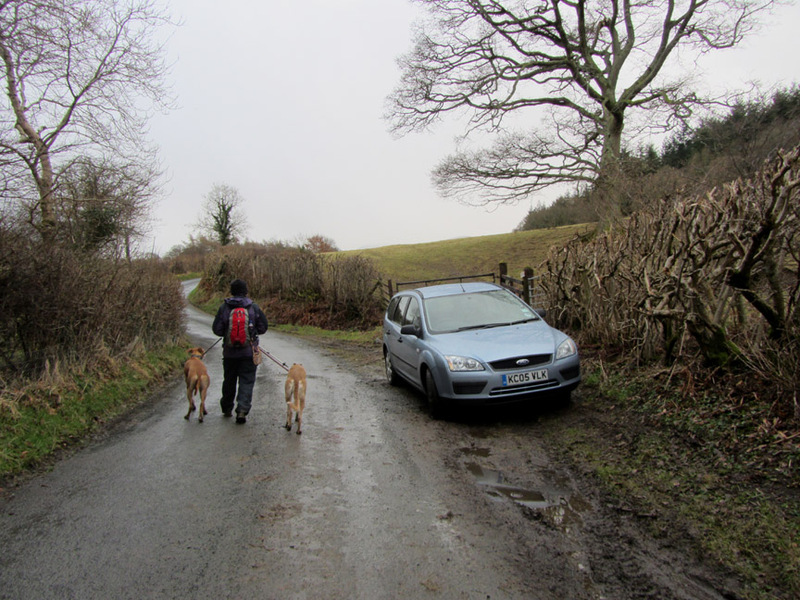 . . we parked at the other car park so have a short road walk before we finish. 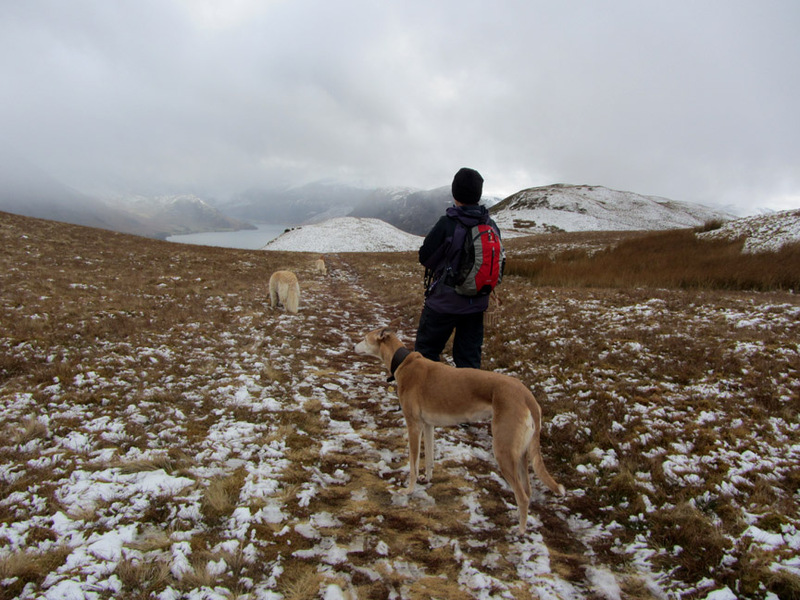 Whiteless Pike, living up to its name. 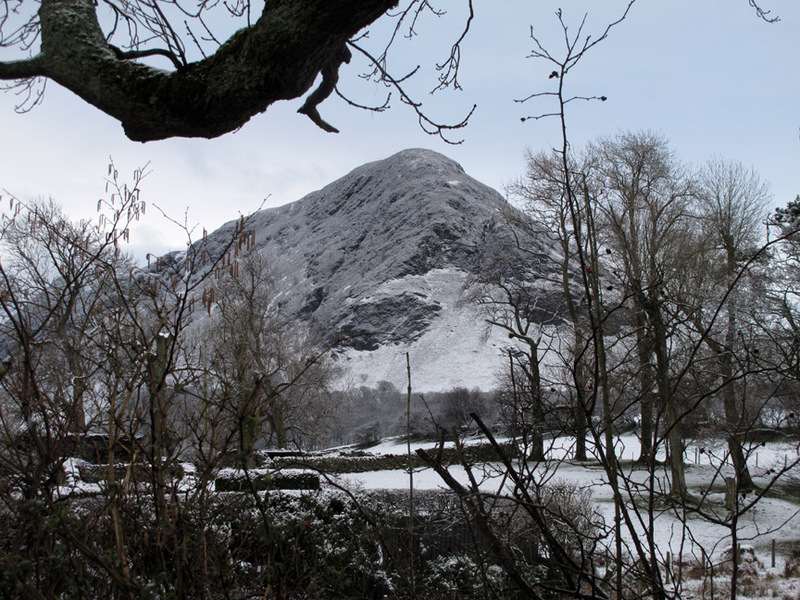 Third Gill Man Head behind has a touch of snow but it is higher and doesn't catch the late afternoon sunshine. 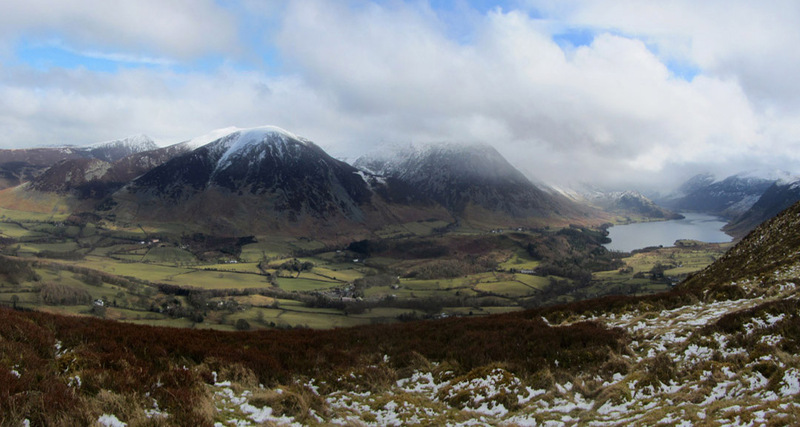 Grasmoor's snow is still hidden in the cloud as we pass Rannerdale Farm. 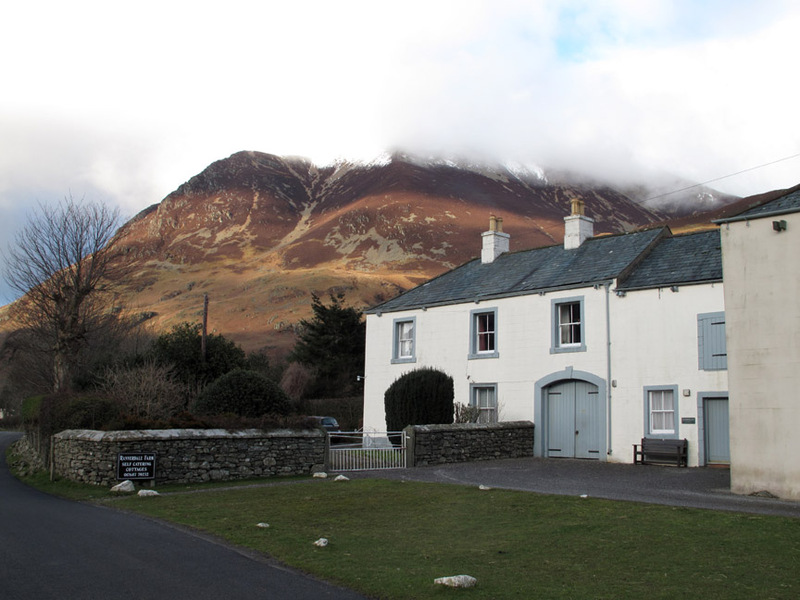 Rannerdale Close Cottage here is available for holiday lets if anyone is interested. 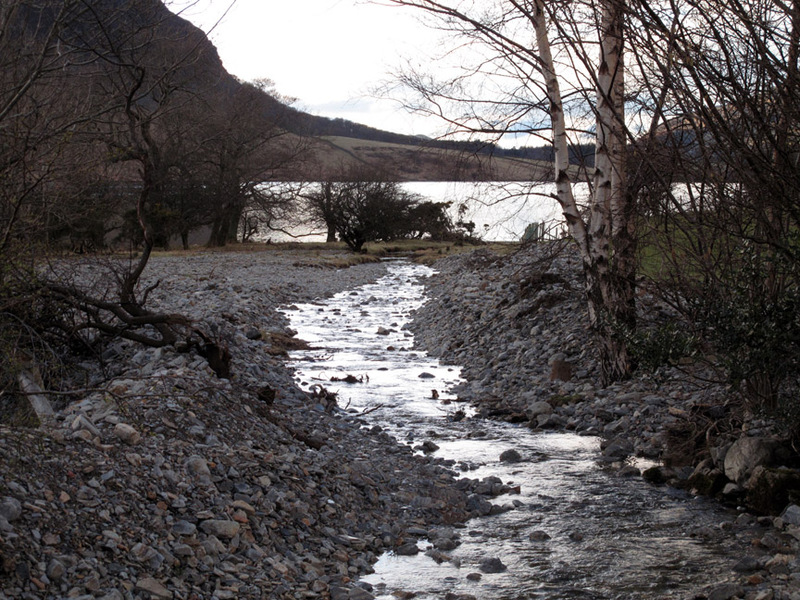 Rannerdale Beck now exhibiting a wide stream bed after the 2009 floods. 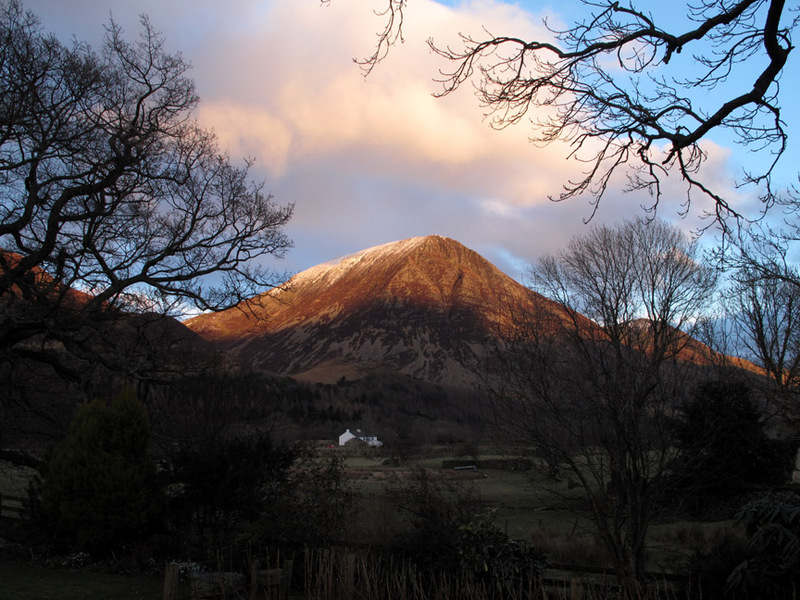 In the early evening, half an hour or so later the sun gave one final last burst of yellow on the fells around. This is Whiteside . . . seen over the rather under-used greenhouse at this time of year. was our final parting memory of a reasonable afternoon walk and somewhere new for Jo to visit. Next morning . . . no, not a black and white image of the previous photo . . . nor a computer scan of an old Wainwright picture. 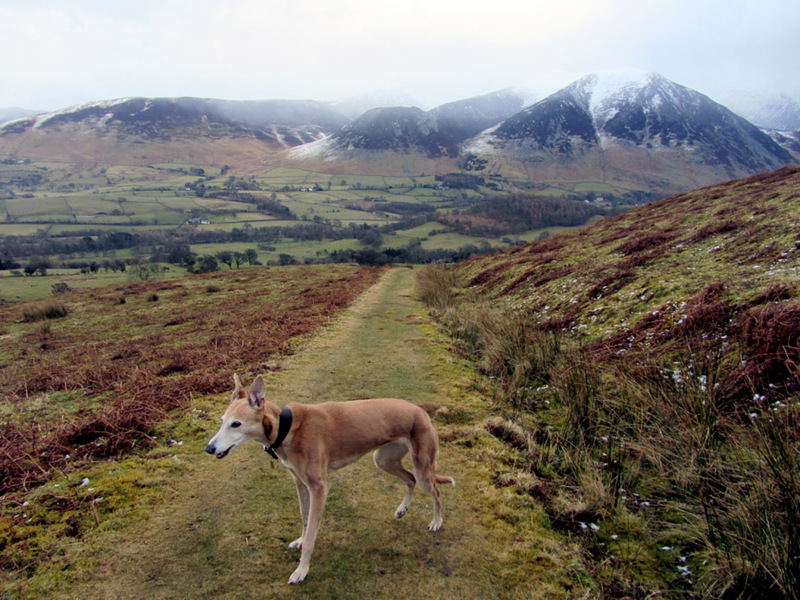 The snow had returned and all the colour has been drained from the valley in favour of a return to winter. 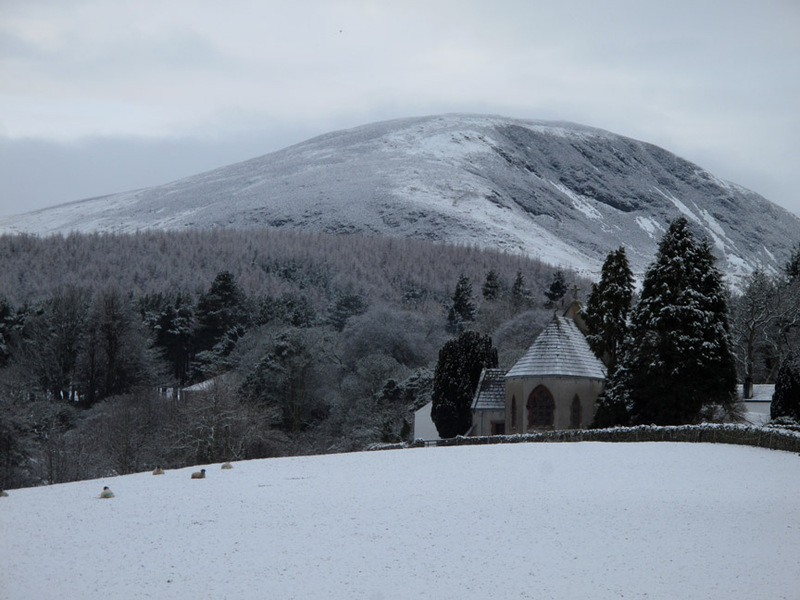 Loweswater Church across the fields . 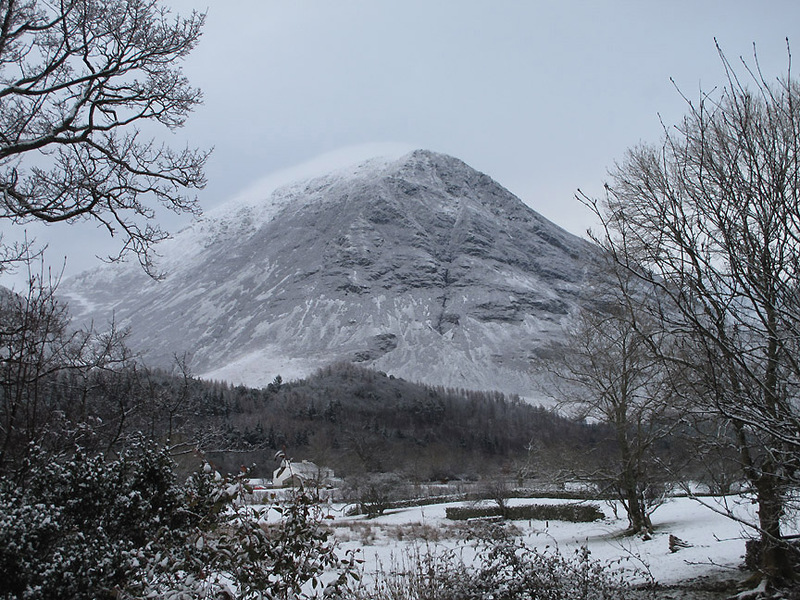 . . with Black Crag behind. 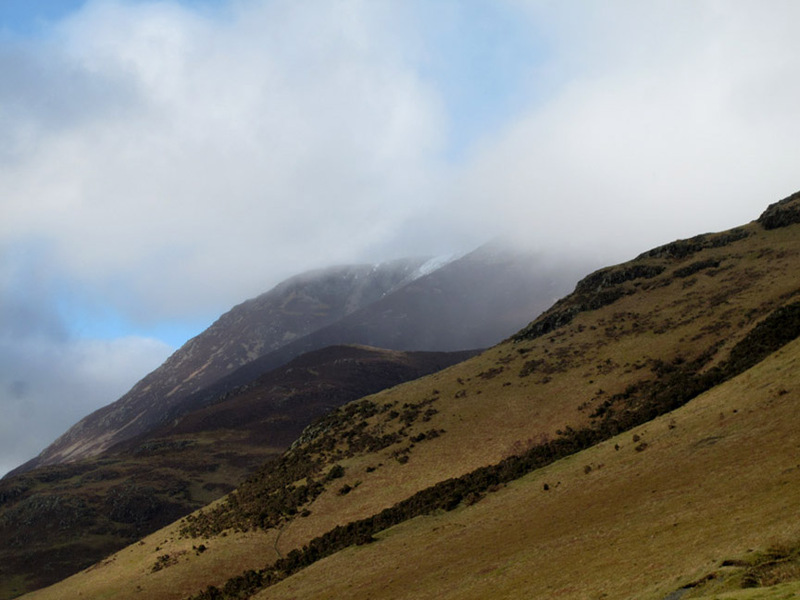 The northern climb of Mellbreak looks dramatic this morning. Another view from a little further down the garden. 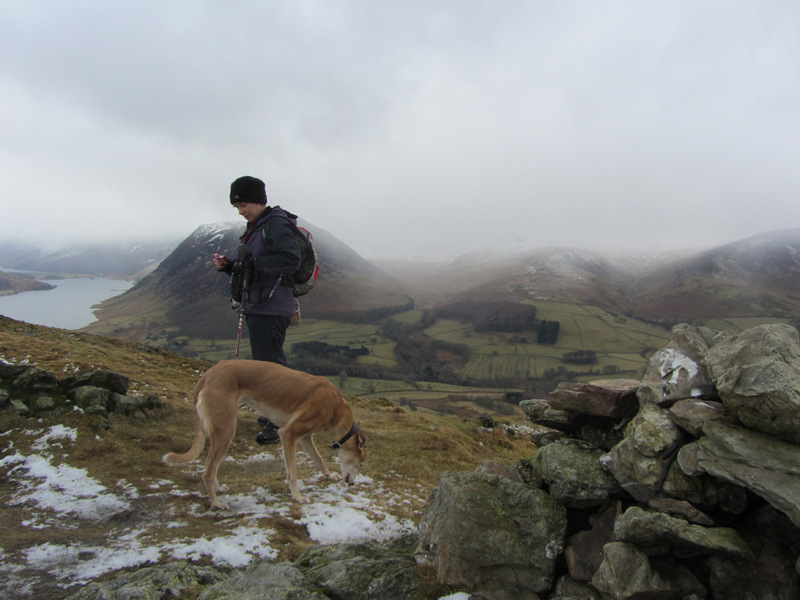 and decided it would be a suitable place for a walk before Jo had to leave for home later in the day. 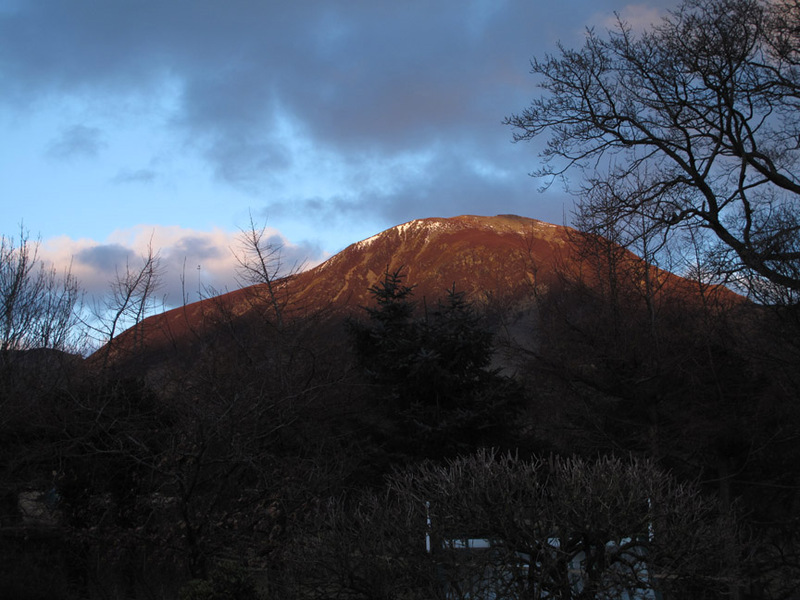 melting the snow on the lower slopes. This is the top of the garden of Thackthwaite House as the path leads out across the fields to Low Fell. 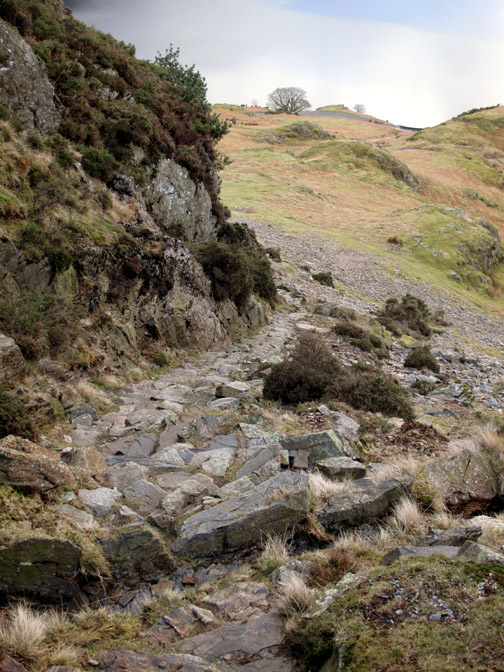 The old track leading up in a semi-circle up onto Low Fell. 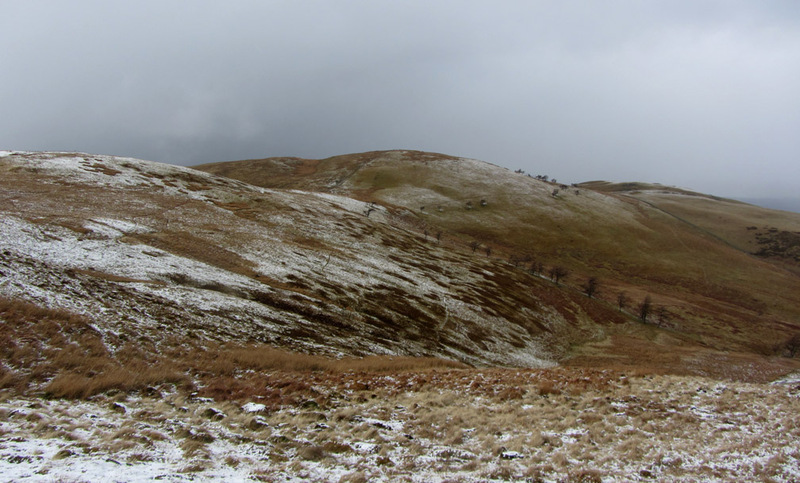 Behind the Hopegill Fells are still experiencing a little adverse weather. 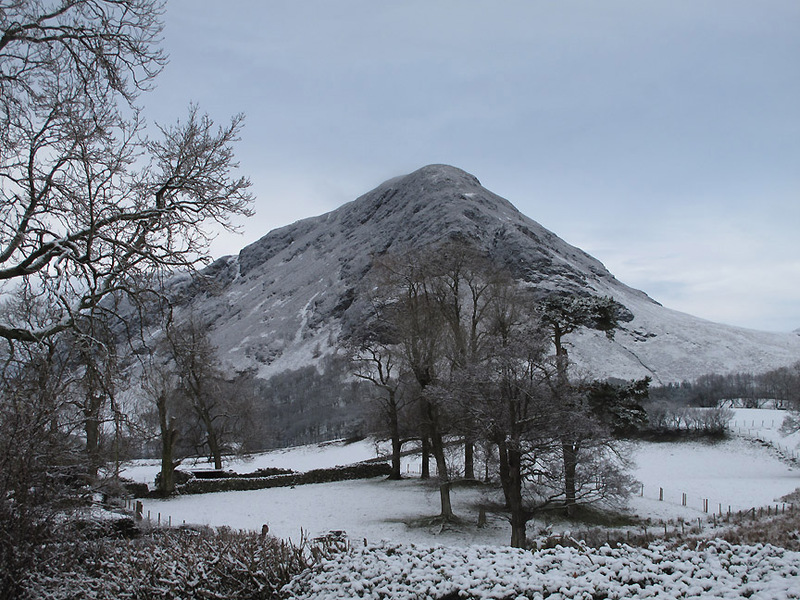 Higher now and the snow on the northern slopes of Low Fell has not melted anywhere near as much. 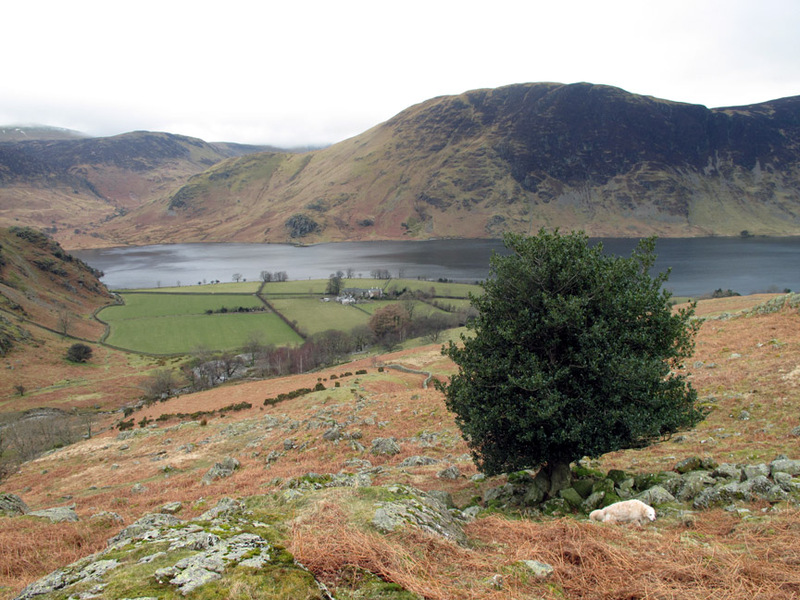 Looking across to Fellbarrow . 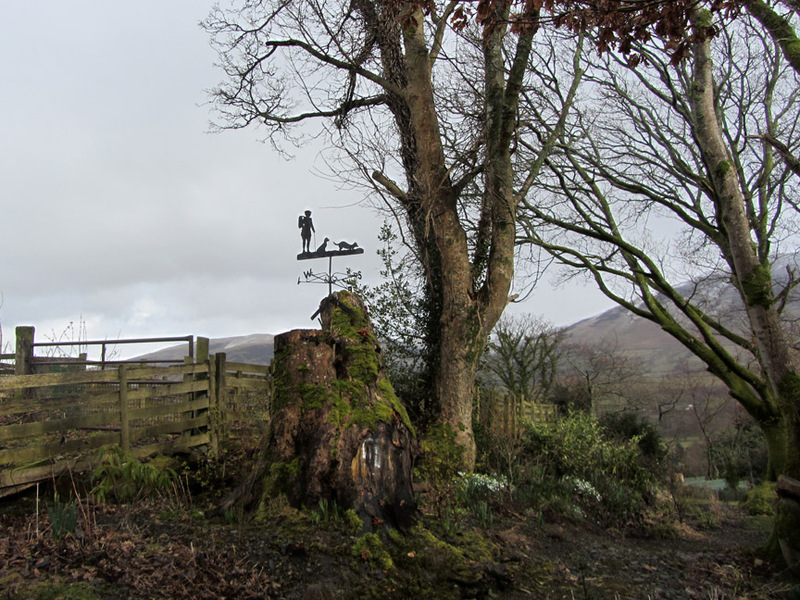 . . it looks cold and damp today. 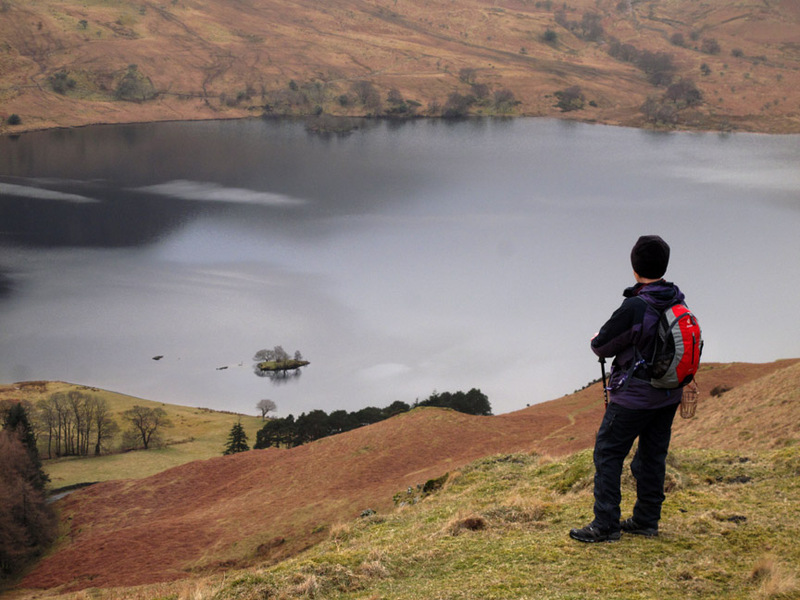 Over the top near Watching Crag and Jo catches her first glimpse of Crummock Water from Low Fell. 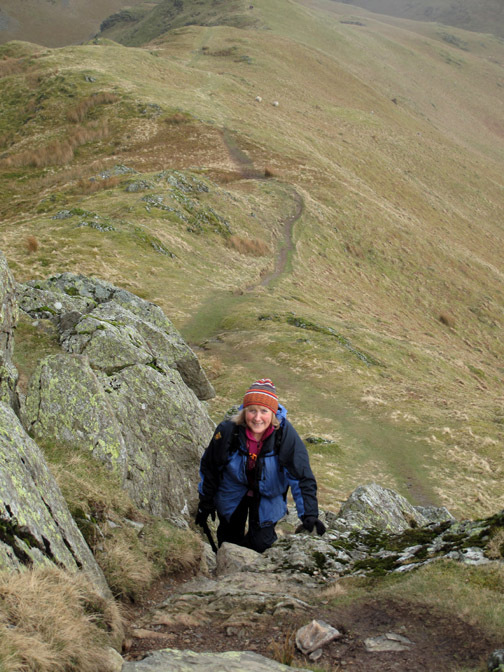 The start of the steeper climb leading to the summit. 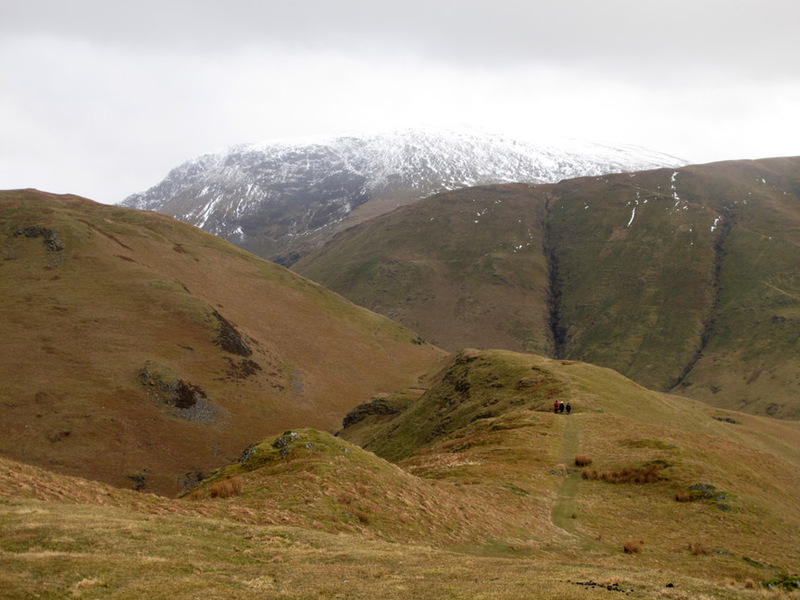 A wider view from the more level top near the central summit of the fell. 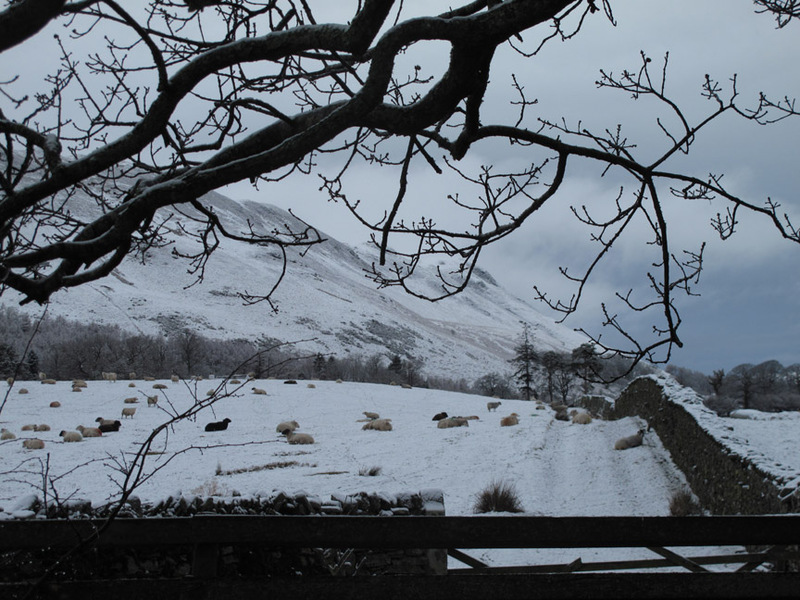 The overnight snow has left a new layer of snow on all the high fells. 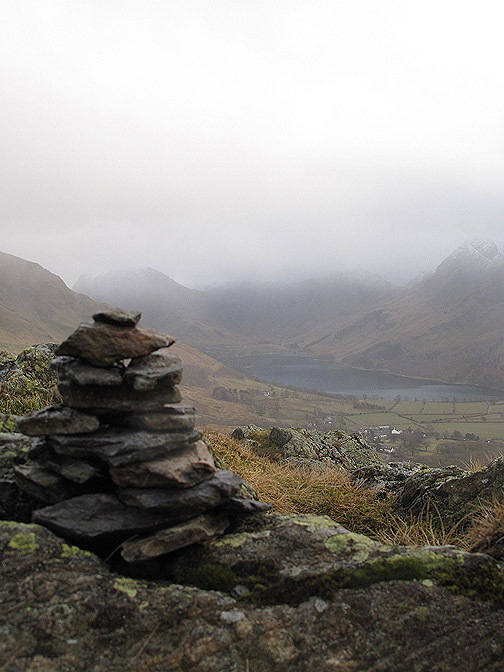 Harry pronounces that we have arrived at the summit cairn. 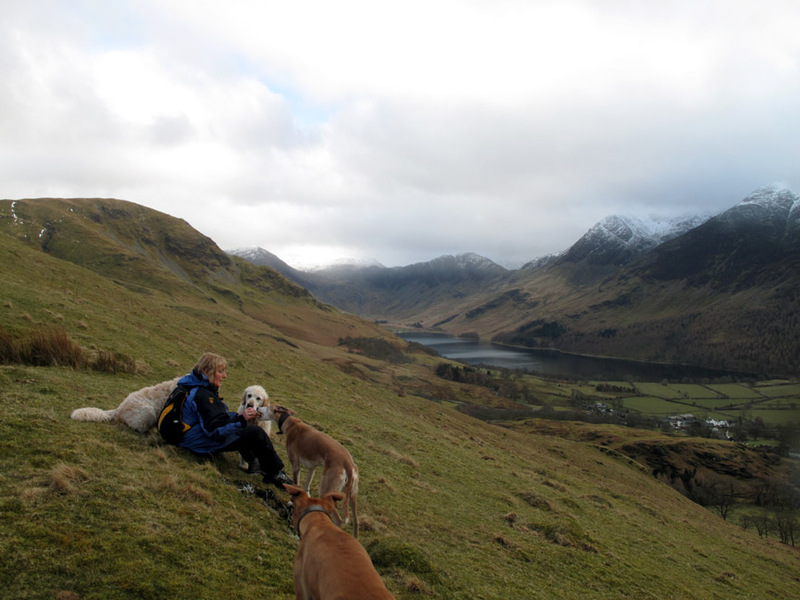 Amber is not fussed and sits to admire the view. 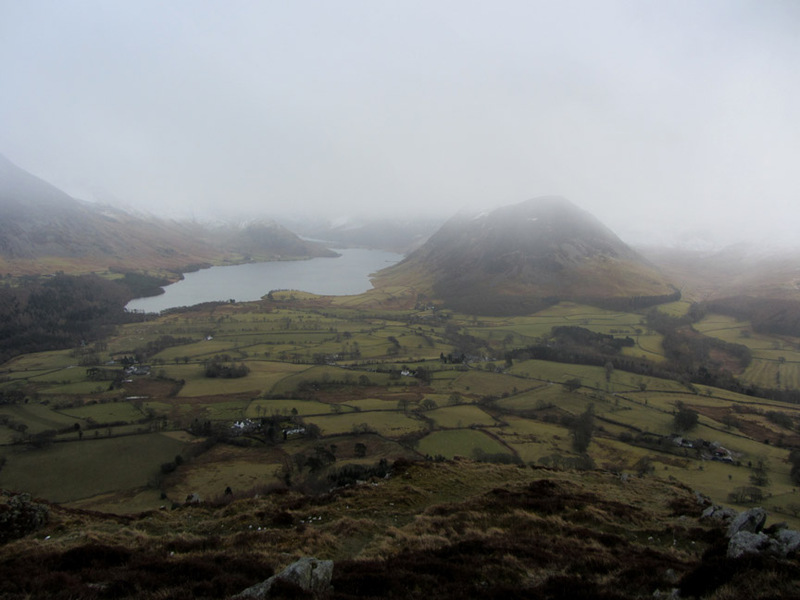 but the weather is not too kind and the view leaves a little to be desired. Looking down on our part of the world. Walking back the same way and the weather improves slightly. Back down in the village of Thackthwaite and to the car waiting to take us home. All aboard . . . hang on there's one missing ! All sorted . . . let's shut the door on that walk and head back for a cup of tea. Any scones on offer today ? This site best viewed with . . . A variety of clothing to suit the weather.